KitchenAid has debuted its new Smart Oven+ at CES 2019, compatible with Google Assistant and Amazon Alexa voice commands. Inspired by the iconic KitchenAid stand mixer, the oven features three interchangeable powered attachments. 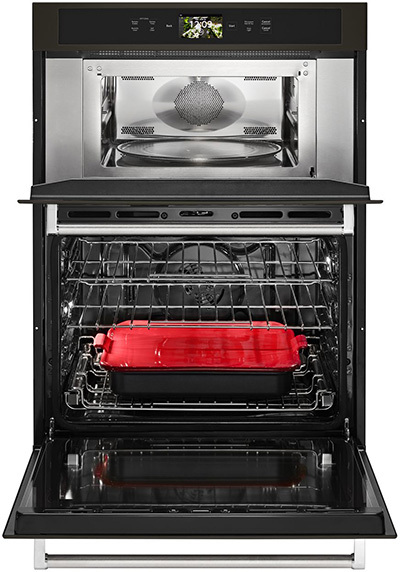 The new Smart Oven+ will be available in single, double, or combination models with three interchangeable dishwasher-safe attachments, designed to grill, bake, or steam respectively that each connects to a powered hub at the back of the oven. The powered grill attachment is designed to reduce smoke output and flare-ups that are usually experienced with a traditional outdoor grill. The steamer attachment can be used to cook anything from pasta to potatoes, vegetables to meat or fish, for up to a family of four. The baking stone attachment is designed to crisp up dishes and KitchenAid claims it can preheat in half the time of a regular baking stone. The grill attachment comes with the oven, and the steamer and baking stone attachments will be sold separately. The oven uses KitchenAid’s Even-Heat True Convection technology for even cooking by circulating airflow. The Smart Oven features a 4.5-inch colour, LCD glass touch control display and can also be controlled remotely with the KitchenAid app or via voice-assistant like Amazon Alexa and Google Assistant to control the oven when hands are busy elsewhere. The Smart Oven+ will also work with the Yummly app, so users can peruse and select recipes, update shopping lists, and can even be recommended recipes and techniques based on the users’ preferences and history. The announcement comes after the debut of KitchenAid’s splashproof Smart Display, no news on pricing or availability at the time of writing.